Everyone has been guilty of poor posture. Whether you hunch over your computer at work or tend to slump down while eating dinner, many people are aware of their poor posture, but just never do anything to fix it. You are probably aware that good posture comes with a variety of benefits, but it may not have occurred to you that the opposite is true as well: poor posture has a variety of negative effects on you. You know that you should stand up straight, but you may not know exactly what that poor posture is doing to you. In this blog, we will go over the negative effects of poor posture to help motivate you to stand up straight. When you slouch down, it causes your muscles to work harder, leading to muscle pain and soreness. Many people ignore the soreness and pain caused by their poor posture without realizing that they can cause long term health problems. Bad posture often causes chronic pain because it causes so much stress on your spine. If you suffer from lower back pain without knowing why, there is a good chance it is due to your poor posture. You probably haven’t considered how your posture impacts your mood, but it actually can have a profound impact on your sense of well-being. One study in the Journal of Health Psychology found that participants who sat in a slumped position were more fearful, had lower self-esteem, and were more likely to experience bad moods than their counterparts with good posture. Additionally, linguistic analyses of those with bad posture found more negative words were used. Bad posture can increase both physical and mental stress. 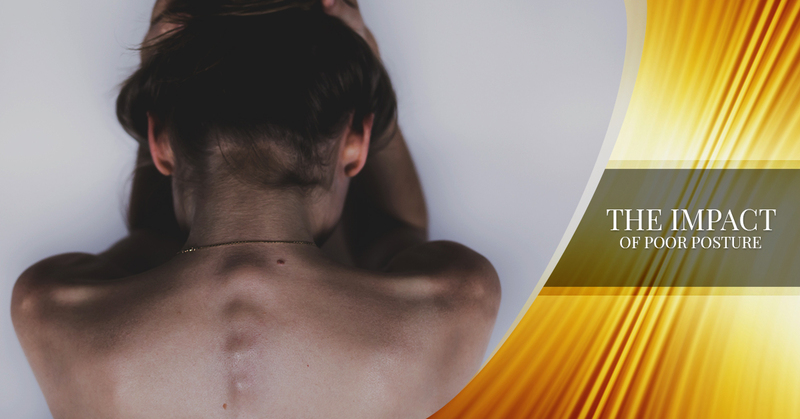 Because bad posture causes your back muscles to work harder, it causes physical stress and therefore, pain. This pain has a negative impact on our mental health, too. In the study mentioned above from the Journal of Health Psychology, a correlation was established between posture and reaction to stress. The results of this study indicate that sitting up straight may help you become more resilient to stress. Additionally, it was found that bad posture decreases testosterone and increases cortisol, the stress hormone. The nerves in the neck and back are responsible for muscle function in the wrists, arms, and hands. This means that poor posture can have a direct impact on this muscle group which is susceptible to carpal tunnel syndrome. If you suffer from carpal tunnel, there is a good chance that your poor posture is contributing to it. Clearly, most people don’t understand the established psychological link between posture and mental health. Just like poor posture can cause your confidence to suffer, it can also cause you to be less motivated. Depression and anxiety often cause people to feel less motivated, so the established connection between posture and mood makes sense in this context. If you are feeling less confident, you may have a difficult time branching out in social and work situations, which may also impact your motivation. Many people do not consider the impact that their poor posture may be having on their digestion. When you slouch, your organs are bunched together. This makes it more difficult for your body to digest food, causing constipation. This can have a negative impact on your metabolism, ultimately causing lifelong issues with processing foods. As we have established above, poor posture makes your body have to work harder. This leaves you feeling tired all the time. It is normal for your body to be upright, so when you have poor posture, your body is constantly fighting to be in its correct position. Doing this requires more energy, leading you to feel fatigued. The best position for your lungs to work optimally is when you are sitting upright, as your diaphragm and rib cage are able to expand properly. When you have poor posture, your oxygen and blood flow are restricted, making it more difficult to breathe. If you have ever sung before, you know the importance of proper posture to promote breathing. As you can see, it’s important to practice good posture to ensure that your health is optimal. When you need a physical therapist in Hopkins, contact Hopkins Health and Wellness Center for an appointment today!